They're toe shoes, for running—but wait! Only four toes? And those soles... thick but light. Just what the hell are these things? They're Fila's new Skele-toes Amp. The company's first attempt at a more natural running shoe. Do they actually perform, or are they just trying to ride the barefoot bandwagon? Wannabe minimalist runners. They're like barefoot training wheels. The toes are separated, and the upper is thin, but the soles are thick and padded. 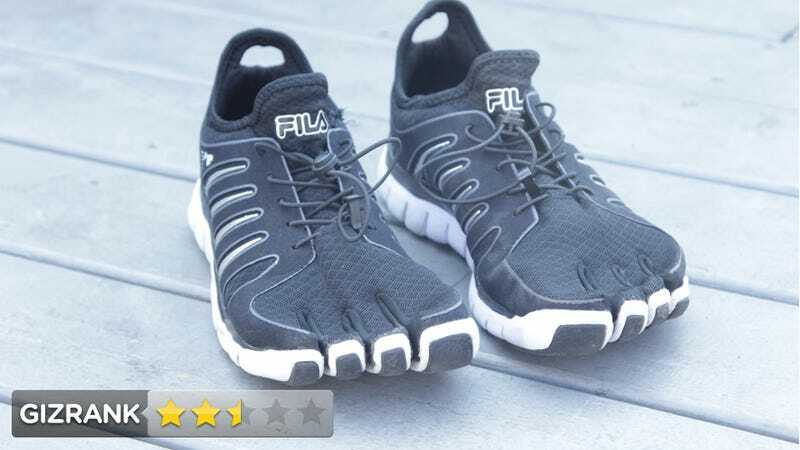 It's like the Vibram FiveFingers and the Nike Frees had a baby. Very light and definitely easier to run on your mid-to-forefoot than traditional runners. Way too much foam to be considered "minimal" or "barefoot," though. The lightness and the shock-cord lacing system is terrific. The padded heel allows you to walk like normal. They're too rigid and there's a lot of excess material which causes chafing. There aren't five toes, there are four. There's one combined hole for your pinky and your, uh, ring toe? (Is that what you call it?) This supposedly makes them easier to slip on compared to a five-toed design, but they aren't because they're too rigid. • You have to wear socks (toe-socks, mind you) with them. Kickback for the powerful toe-sock lobby? • The shape of the two-toe pocket is poorly designed and your pinky gets bullied into the corner, resulting in chafe. • There's a bit too much foot-slide, which you feel on your forefoot after a few miles. • Even with socks, these will chafe after twenty minutes or so—though YMMV. • The materials are strangely cut, making the upper bunch up in places. • The four-toe thing just looks weird and unnatural. It's actually more jarring to look at than the Vibrams. Depends. If you're a minimalist runner then absolutely not. However, if you're a wannabe minimalist runner, then yes, if you can find a cheap pair, why not. I wouldn't go the full $75—especially since you'll need special socks—but if you can find a pair for $50 they are a decent first-step toward barefoot-style running. You'll be able to start building up the muscles in your feet and lower calves without as much initial impact as you'd experience through real barefoot shoes. I wouldn't wear them on any long runs, but like I said, cheap training-wheels.